Happy Independence Day everyone here in the U.S.A.! Anyone have any fun plans? We’ll likely be hanging out here at home, inside, because it’s too hot outside! So the 4th of July coincides with Indie Wednesday, and luckily all but 1 of my ‘patriotic’ polishes are indies- outside of solid colors. The only one that is not would be Julep America. Today I’ll be showing off 2 different looks- the first I did last night, and the second is actually my mani from Memorial Day. First up: Girly Bits Star Spangled! 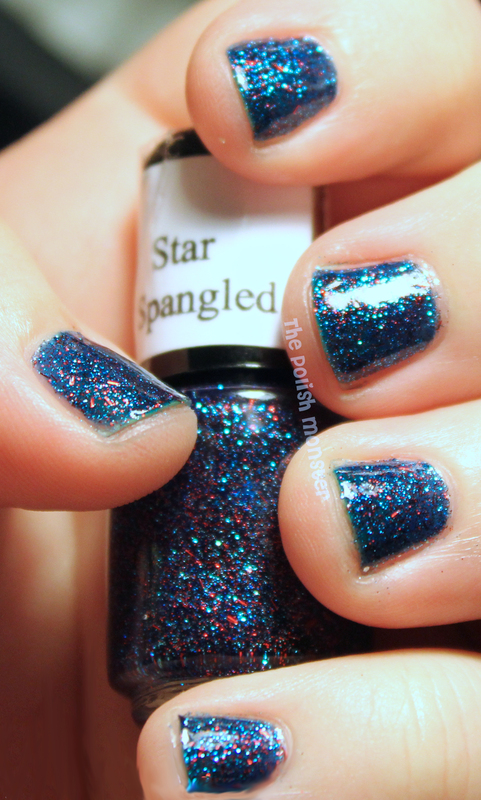 Star Spangled is a gorgeous polish. It’s a blue base filled with itty bitty red bar glitter and fine blue glitter. This gives a super sparkly, yet subtle look. All pictures are 3 coats of polish plus 1 of Poshe topcoat. I probably could’ve gotten away with 2 coats, but I went ahead and did 3. The polish is a much deeper blue with 3! The second polish to show off is Pretty & Polished’s Freedom Calling. I bought this back in May, and these are photos of my Memorial Day mani a few weeks before I started blogging. I was prepared though, taking pictures! I layered 1 coat of Freedom Calling over 2 coats of Orly’s Skinny Dip from their summer Feel The Vibe collection. 1 coat of Seche Vite on top… I’m sure you’ll notice the bubbles from it. I did NOT notice all those bubbles until I was looking at the picture- they were completely invisible to the naked eye. Then when I checked out the pictures, I was like ‘eek!’. One of the reasons I now use Poshe primarily for a topcoat. I just love the random big hexes! I’m glad I was finally able to show off these pictures! You can buy both brands at their stores when they restock (I believe Pretty & Polished will be restocking TWICE this coming Thursday! ): Girly Bits and Pretty & Polished. Both can also be purchased on Llarowe’s site, and Girly Bits can be found at Harlow and Co.
Hope everyone has a safe and fun 4th! And if you’re in a drought area (like we are), please use extreme caution with the fireworks! This entry was posted on July 4, 2012 by The Polish Monster. It was filed under Uncategorized . These are both great but I LOVE the second one!! Me too! It was fun layering it over a bit of a non-traditional USA blue. I got a lot of compliments on my nails that day! My mani for the 4th (which I’m still sporting) was 2 coats L’Oreal’s I Will and then China Glaze Love Marilyn and Nostolgic Nail Laquers Rollin’ with the Homies on top. My ring finger was Sally Hansen Thinking of Blue with China Glaze Snow Globe and Revlon Stunning on top. The Revlon didn’t have the coverage I would have liked, and had I known that I would have just used the CG. But it is a very sparkly and patriotic 🙂 Glitter makes me smile! My husband was impressed that I used 6 polishes at once heehee! At least I’m pretty sure I placed a pre-order? LOL that’d be awful if I never did and have been waiting this whole time… No, I swear I ordered Jem and I think Pizzazz, and then Way Harsh (or maybe As If!… but I think it was Way Harsh). I’m impressed you used that many too! You should take a picture and send it to me!